Quality education that begins with Biblical teachings and Christian values integrating a comprehensive curriculum. The summer camp program is a time for learning in a fun environment where children will learn through hands-on experiences. Each week will focus on a different theme and special guests will teach our students more about the concept they are learning. Come join us for the fun! plant, and caring for plants. color mixing, and making paper. them, and experience a petting zoo. and effect, hypothesizing, and questioning. and touching tide pool animals. APPLICATION FOR ADMISSION: We’ve gone GREEN! Western Christian Preschool’s Application for Admission is available online at the following link: https://www.westernchristian.org/apply In order to complete the online application you will be asked to create a user account on myWCS.com, which is Western Christian’s own student information software. 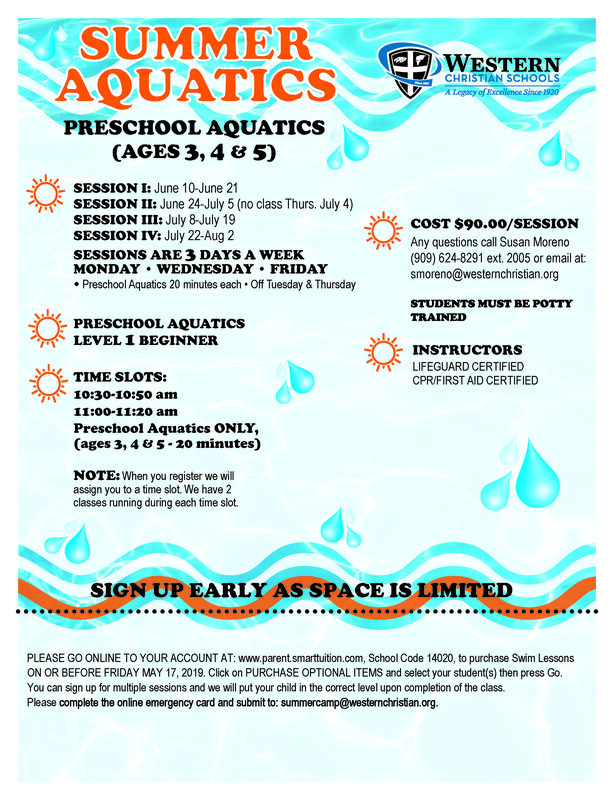 PRESCHOOL REGISTRATION PACKET will be required upon enrollment into our Preschool. You will have 30 days to complete the Preschool Registration Packet which can be downloaded here or picked up in the Preschool office. IDENTIFICATION AND EMERGENCY INFORMATION: We will only release your child to an adult that is listed on this permission form. CHILD’S PREADMISSION HEALTH HISTORY: To be completed by a parent and will be shown to your child’s teacher so they may know how to best care for your child. Please list any allergies that your child may have. PHYSICIANS REPORT: To be completed by your physician and MUST be submitted before your child starts school. CONSENT FOR EMERGENCY MEDICAL TREATMENT: Your signature is required on this form to allow the treatment of your child in an emergency. Please list all allergies your child may have. IMMUNIZATION RECORDS: A copy of your student’s immunization card must be on file. Please copy the yellow shot record completely. A TB test waiver must be signed if your child has not had a TB test done. PRESCHOOL TUITION CONTRACT: This form lays out the terms of your enrollment including your child’s hours, tuition fee, and important financial policies. TUITION: Monthly tuition is due on the first day of the month your child is scheduled to attend.